We have a lot in our catalogue, and you have a lot on your mind. 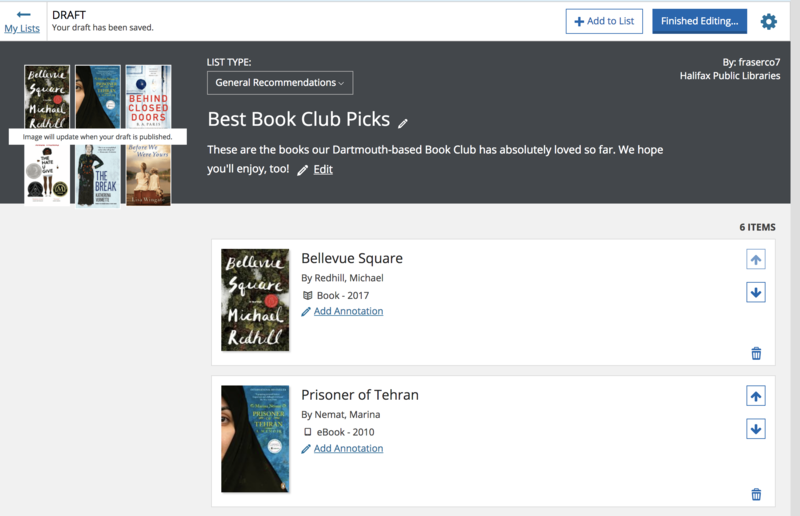 On our new site, you can make your own lists, comment on items, and share ratings with the Library community. It’s easy. So, what types of lists should you make? It’s up to you! To find the list-making feature, first log into your Library account. Click the My Account/Login website menu tab. Under the category of MY COLLECTIONS, you will find Lists. 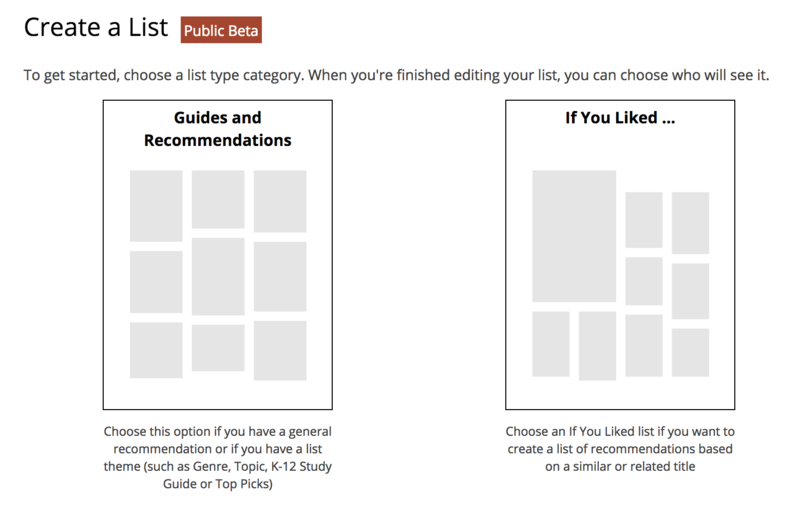 To make your own list, click Create a New List, then choose the category of your list—either a Guides and Recommendations list (for general recommendations, a list about a specific subject, or theme) or an If You Liked… list (for making comparable recommendations based on an author or work). When creating a list, you'll be able to choose from 2 types of lists. The other type of list is the If You Liked… list, which lets you create a list of similar items (in Library lingo, we call comparable books read-alikes!). For example, you may know that you like Dan Brown books because they are fast-paced, suspenseful page-turners. You can make a list of similar authors and books so that others can find those read-alikes. These lists can be about any items you like, not just books. An example of the process for making a list. Add a title and a description that describe your list and make it easy for members to find. Now, you can start adding items (books, movies, TV shows, magazines, graphic novels, etc.) to your list. Note that you need to add at least 4 items before a list can be published. Search the catalogue to find items you want to add to the list; the search feature is built right in to the list-making page. Once you have located the item, click Add+ to add the title to your list. Everything is automatically filled in for you – title, author, and item format. And, a link is created to the catalogue so that others can see the full record. You can customize the list and make it your own by re-arranging the order of items, numbering them, adding annotations for a personalized touch, and mixing and matching formats (books and DVDs, for example). Everyone: This makes your list accessible to members across all Library websites created using BiblioCommons (e.g. Edmonton Public Library users). Only people in a specific location: For example, Halifax. Anyone who has the link: Use this if you'd prefer to just share the link to your list with a few friends, for example. You can change this setting in the future if desired. We know you have opinions about the books, movies, and CDs you borrow. Why not share your thoughts? Rate and review items on any Library item page (the page that appears once you've searched and found an item in the catalogue). You can share your reviews by assigning a star rating, adding comments, and adding other content like quotes to the catalogue. You need to be logged in to do so. Ratings and reviews allow to you share your opinion and help other like-minded Library members decide what to borrow. They also help keep track of what you’ve borrowed and enjoyed (items you rate are added to your Completed Shelf). When logged in, you will see 2 sets of stars associated with every item in our catalogue. The rating scale is based on 5 stars – from 1/2 a star up to 5 stars. By default, the stars are set from ½ star—awful—to 5/5 stars—outstanding. 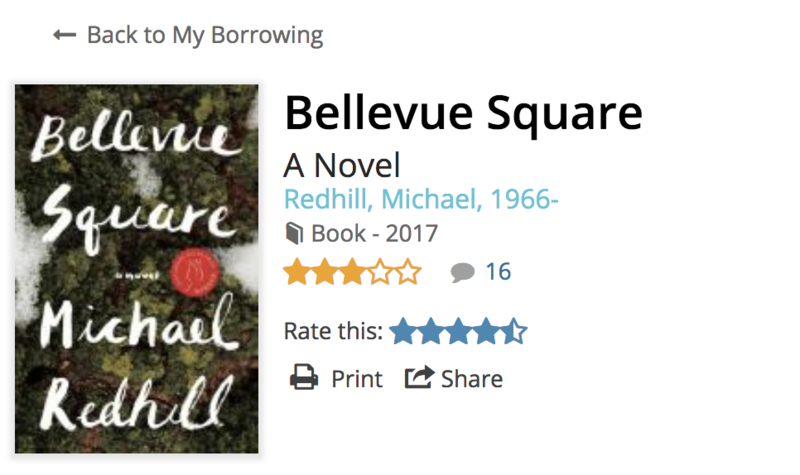 If you'd like, you can edit your personal rating scale to let others know what you mean by a 4 star rating, for example (set this up in the My Profile section of your Library Dashboard). There are 2 sets of star ratings for each item. The blue stars show your personal rating, and the orange stars represent the average rating from all users. You can contribute to the conversation about different items in the OPINION - COMMUNITY ACTIVITY section. Now that you’ve shared, it’s time to explain your latest review. Scroll to the OPINION > COMMUNITY ACTIVITY section of the Library item page. You can expand on your star rating by writing your own review in the Comments section. It’s a simple as clicking Add a Comment, typing your thoughts, and clicking Post Comment when you are finished. Just remember to leave out spoilers so you don’t inadvertently ruin any surprises for other would-be readers! Other readers can "flag" your comment if it does contain spoilers, and the comment will be hidden unless users choose to reveal it. There are other ways to add extra content to the catalogue, including your opinion of the Age Suitability for an item, your favourite Quotes from a piece, a Summary of the work, tags, and similar titles. Explore the community activity and have your say! We hope you'll enjoy making lists, rating, and commenting on library items. Your contributions help strengthen the Library community. Now that you know how to make your own lists, find out more about lists created by Library staff in our blog about Staff Lists.